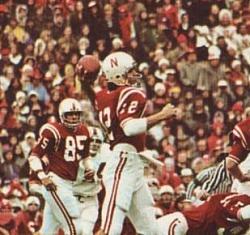 David Humm was the Huskers' quarterback in Bob Devaney's final season, 1972, and Tom Osborne's first two seasons, 1973 and 1974. Thirty years later, many of his school records still stood, including the trifecta of passing yards in a career (5,035), season (2,074) and game (297). 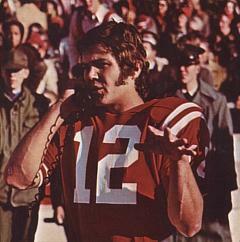 Nicknamed "The Dealer," the QB from Las Vegas completed a school-record 15 consecutive passes against Kansas in 1974, the same year in which he led the Big Eight in both passing and total offense. On the receiving end of his aerials during his three-year career were the likes of Johnny Rodgers, Jerry List, Frosty Anderson, Don Westbrook, Ritch Bahe, Dave Shamblin, Bob Revelle and Tony Davis. 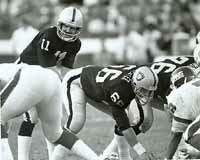 After averaging 152.6 yards per game passing during his career at Nebraska, he was drafted by the NFL's Raiders and spent most of his pro career with the franchise, winning two Super Bowl rings. 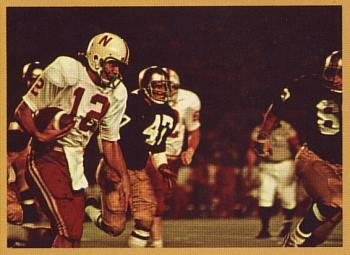 in the 1973 Orange Bowl romp over Notre Dame. Letting one fly during a 1972 game. Conferring with the coaches upstairs. Taking a snap with the Raiders.